Maltus Lalande de Pomerol is made from 80% Merlot and 20% Cabernet Franc. This is the newest project from Nicolas Lassagne (Chateau des Landes). He acquired this 2.5 ha (6.17 acres) parcel in 2015. The Bouquet is rich, generous, complex and reveals notes of black fruits. The palate is round and powerful with some good integrated tannins. The finish is long and structured. History tells us that the origin of the Château Maltus goes back to the Middle Ages, in the time of the crusades. 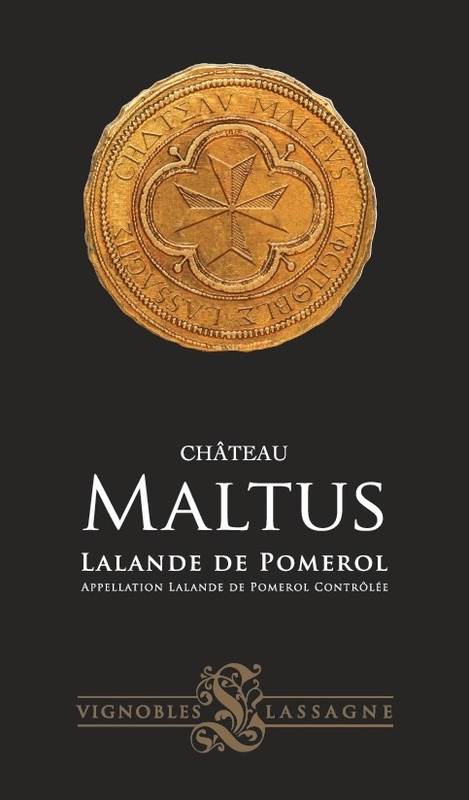 The Order of Malt, well implanted on the land named Lalande de Pomerol, cultivated for the first time vines on the grounds of the Château Maltus. "A blend of 80/20 Merlot and Cabernet Franc, the 2016 Chateau Maltus spent 18 months in French oak before bottling. This deep ruby/purple-colored Lalande-de-Pomerol boasts outstanding notes of chocolate covered cherries, blackcurrants, dried earth, and licorice. With medium body, a rounded, mouthfilling texture, and supple tannins, it’s an incredibly charming, delicious 2016 to drink over the coming 8-10 years." Château des Landes was created in 1952 by Paul Lassagne, Nicolas' grandfather. He started with only 2 hectares and grew to 7 hectares in 1979. His son, Daniel, came along and bought more vineyards surrounding the cellar and he managed to grow to 27 hectares in almost 20 years. In 2001, Nicolas, came aboard and decided to continue on the family tradition bringing his expertise and his knowledge. Nicolas is now in charge of the Estate and he manage 27.2 hecatres of vineyards (68 hectares). 27.2 hectares (68 acres) of vineyard with a density of 5,500 vineplants per hecatres ( 2,217 vineplants per acre). The average age of the vine is 30 years. The soil is mostly a mix of Clay and limestone, while the subsoil is white clay. Avatar Malbec is 100% Malbec. Trois Moulins Haut-Medoc Cru is amde from 52% Merlot, 33% Cabernet Sauvignon and 15% Cabernet Franc. Average age of vines: 19 years. "Equally divided between Merlot and Cabernet Sauvignon with a seasoning of Cabernet Franc, this richly perfumed wine is juicy and full of blackberry flavors. From the same ownership as Cambon la Pelouse and in the southern Haut-Médoc, the wine will age well. Drink from 2021. - Roger Voss"